If you’re heading to Vegas this summer, there’s a brand new way to cool off. 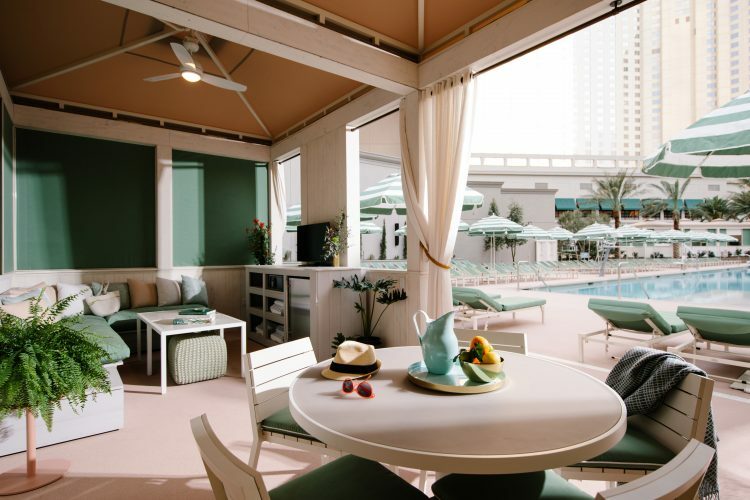 Park MGM, opening this spring, has just debuted a new pool oasis that channels the South of France with a vibrant atmosphere featuring three pools, an oversized heated spa, 12 cabanas, lounge areas and multiple bars. The three pools — the South Pool, East Pool and North Pool — were designed by Martin Brudnizki Design Studio who drew inspiration from the natural surroundings of a country estate, incorporating layered horticulture to shape each pool space. Each features lively music, Baja shelf seating and submerged wet decks. For those seeking the good life, the East Pool has a VIP area with deluxe cushioned chaises. Craft Drinks: Sip on tasty cocktails from three different bars, including the main Vista Bar which features a tropics-inspired beverage program. Choose from the Park Punch, a frozen pineapple cocktail or mix-and-match craft beer buckets. Other drinks include young coconut, fresh fruit juices and a Bacardi Dragonberry rum-spiked Frosé topped with strawberries. Poolside Bites: Snack on fresh summer eats like a watermelon and arugula salad, fajita chicken nachos or a tuna poke bowl, made with spicy tuna, pickled carrot, English cucumber, green onion, toasted sesame, nori and steamed rice. Reserved Seating: Chaise lounges are available for reservation throughout all three pools. Guests who reserve these seats will enjoy complimentary amenities throughout the day from frozen grapes to specialty cocktails. Private Cabanas: Twelve private cabanas serve up the VIP treatment with deluxe amenities including a 55” LED television; misting system; personal safe; and ample seating with plush cushions, lounges and umbrellas. Cabana guests enjoy a variety of beverages including large-format bottle service and fresh, summery food. The new pool oasis is part of MGM Resorts and Sydell Group’s partnership to transform Monte Carlo Resort and Casino into two new distinct hotel experiences, a Las Vegas version of Sydell’s widely acclaimed NoMad Hotel, and a new luxury resort, Park MGM.